It’s been more than eight months since the FCC first announced that it was considering lifting its ban on inflight cellphone use, which was followed almost immediately by the Dept. of Transportation saying it would think about enacting its own ban. Now comes news that the DOT is putting together new rules that would keep airplanes from being chatter-infested flying tubes of anger. More than 20 years ago, the FCC established the no-cellphone rule out of concern about possible interference with wireless networks on the ground. But developments in wireless tech may have reached the point where this is no longer an issue, giving the FCC a possible reason to lift its ban. However, many people are concerned about what could happen if suddenly everyone on a plane could chat away on their phones inflight. There are issues of security and safety — will passengers listen to announcements? Will they heed the directions from crew members? Will people use their phones to call in every gripe about every bump during the flight? Many passengers don’t like the idea of a plane’s cabin — rarely the most relaxed place — being filled with one-way chatter from people who lack volume control when talking on the phone. 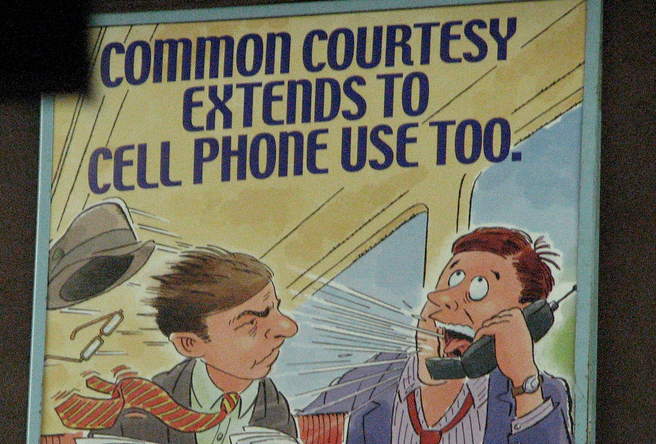 There are already enough in-air confrontations between angry passengers; no need to encourage more of them. According to the Wall Street Journal, the DOT is looking to go public with its proposed rule changes in December. As usual, this would then be followed by a period of public commenting before the agency issues a final rule sometime in the first half of 2015. The FCC has yet to issue a proposed rule change regarding its ban on cellphone use. Even if the FCC did revise its rules to say that cellphone calls are now permitted from planes, a DOT ban would take precedence. Even though the heads of some airlines have said they would not want passengers making voice calls on their planes, the airline industry wants to be able to decide on its own whether to allow the inflight use of phones. The general counsel for the International Air Transport Association tells the Journal that “Airlines aren’t clamoring to allow mobile phone use during flight,” but adds that the carriers may want to come up with supposedly customer-friendly ways of allowing their use, like phone booths or quiet zones. In other words, the airlines don’t want you to talk on their planes unless they can make money off of it. And that’s the thrust of another piece of legislation from airline-funded Pennsylvania Congressman Bill Shuster, the man who thinks we don’t deserve pricing transparency in airline ads. However, the bill notes that a “‘mobile communications device’ does not include a phone installed on an aircraft,” meaning that the airlines could continue to force consumers to use airline-installed phones that they have to pay for.